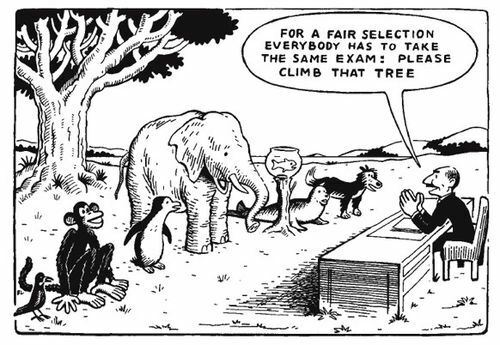 I have written in the past about what passing an exam proves but have never questioned if exams achieve what they were originally designed to do, are they fit for purpose? Firstly let me define what I mean by an exam. A written test administered to assess someone’s level of understanding, knowledge or skill that results in a qualification if successful. This is in contrast to a test which is a method of assessing someone’s level of understanding, knowledge or skill often as part of a course in order to provide feedback. A test does not have to be written. Although exams don’t have to be written either, many are and initially at least I would like to keep the definition as narrow as possible. In order to answer the question, are exams fit for purpose we must first take a step back and look at how we got to where we are now. The first standardised test is believed to have been introduced by the Chinese in 606 AD to help select candidates for specific governmental positions. However most examinations around this time would have been oral, requiring the candidate to recite a dissertation or answer questions. Although there is evidence of written exams being used as early as 1560*, it was not until the 1820’s that many Universities began to adopt the practice. From 1850 onwards the written exam became the norm in most UK Universities. In 1854 under the Gladstone government selection of Civil servants was based on their ability to pass an exam, this time however it was written. Bureaucracy – In 1917 to help bring some order to what had been described as chaotic the Certificate and the Higher School Certificate were introduced. Then in 1951 we had the General Certificate of Education (GCE) examinations, more commonly known as Ordinary ‘O’ level and Advanced ‘A’ level , these were normally taken at 16 and 18. In the 1960’s the CSE (Certificate of Secondary Education) was born, opening up qualifications for all, not just those that went to Grammar school. However this two tier system was thought divisive and so in 1988 under the guidance of the then Education Secretary Sir Keith Joseph both sets of examinations were replaced by the GCSE. The GCSE was graded and contained credit for course work. In 1991 the General National Vocational Qualifications, (GNVQS) were established intended to incorporate both academic and vocational elements, by 1995 these were accepted as ‘equivalent’ to GCSE. In 2014 we find change again, gone is the course work and written examinations once again become the main method of assessment, although there will be grading, 1 to 9 with 9 being the higher mark. The exams will still be called GCSE’s, although officially they are known as GCSE (England). This is to avoid confusion with Wales and Northern Ireland, who are not changing. Historically at least it would appear the purpose of the exam was to provide a recognised and transferable measure of competency in a given subject or discipline. The lack of transparency and consistency of the oral exam resulted in them being replaced with written ones and a more formal bureaucratic structure was developed to administer the process. And in many ways there is very little wrong with this. The problem is not with the exam itself, but with what is being examined. If as a society we value “thinking and creativity” for example, then should we not be examining these rather than subjects that require the candidate to do little more than rote learn facts. Perhaps we should explore different methods of assessment, the written exam has its uses but hand written papers are looking increasingly outdated in a world that communicates electronically not only in short texts and tweets but with video and photos . In addition the way exam results are used in league tables to show winners and losers is divisive. It looks like a measure but has in fact become a target that schools and teachers must hit or be considered failures. In the second blog about exams I want to look more closely at some of these points, in particular what other ways we can assess what people know. *Assessment around this time was through debate between a number of learned people all at the same time and lasting for two hours or more. This entry was posted in Education, Examinations, Teaching to the test and tagged Assessment, Education, Education in England, GCSE, Teaching to the test, Test (assessment), Test preparation, written exam. Bookmark the permalink.